With our September Update, you can now pay for your organization subscriptions using the MPower Payment option when creating, renewing or upgrading your subscription. Here are some details on how to do that. To create an organization on Memberz.Org, you need to first have a personal member account on the platform. The you can use the following steps. Go to the “My Orgs” section of your member account and click on the “Create Organisation” button. Next, choose a subscription plan that suits your organization. If you are just trying out the platform for the first time, then choose the “Free Tier” option which gives you space to manage up to 50 member profiles in your organization. If you choose a paid plan, then you can configure the plan to choose how long you want your current subscription to last for. The options include 1, 3, 6 or 12 months. You can option discounts for paying for 6 or 12 months in advance. Your subscription end date and cost will be calculated dynamically for your information and then you can choose your mode of payment. Next you will be given the option to review the information provided before checking out. On checkout, if you chose the MPower Payments option, you will be redirected to the MPower Payments portal to complete the payments. On completion, you will be redirected back to the Memberz.Org site and your organization will be created. You will receive a receipt of payment email and your organization will be automatically activated. Organization subscriptions and pricing are based on capacities and you can upgrade your organization to a higher capacity at anytime. There is currently no option to downgrade from the platform. To downgrade your organization, please contact our support team. Go to Organization Account Settings -> Subscription to see your current subscription and the possible upgrade options. Choose the new plan to upgrade to from the list. Next, you will be able to configure your new subscription. You can choose the subscription duration (1, 3, 6 or 12 months), with discounts for higher duration. Your subscription end date and cost will be automatically calculated. If your current plan has not expired, you will be offered an extra prorated discount for your new plan. Next choose your payment method. 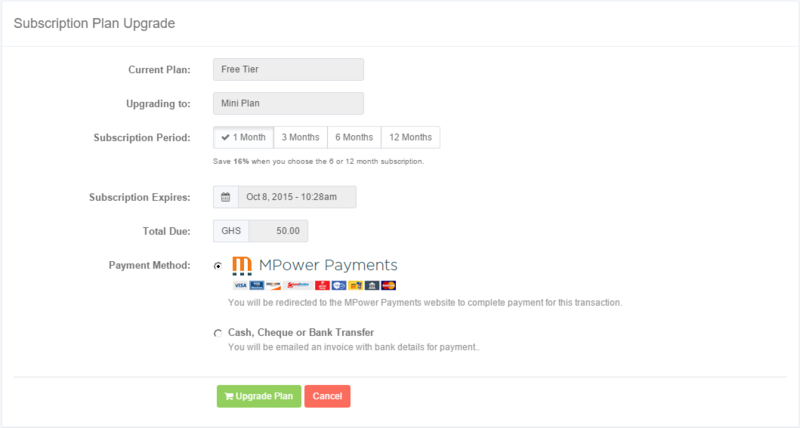 If you choose the MPower Payments option, you will be redirected the payments gateway to complete the purchase. On completion, you will be redirected back to your billing management page where you will be able to verify the completion status of your payments. You will also receive a receipt of payment email to confirm the purchase. You can go to your Subscriptions page to see the details of your upgrade. If you have an issue with your upgrade, you can contact our support team for further assistance. Click on the “Renew” button from either the dashboard or your subscription management page under account settings. Next you will be presented with the options to choose the duration of your subscription (1, 3, 6 or 12 months) with necessary discounts options. Depending on your selection, the cost and subscription end date will be automatically calculated. On completion, you will be redirected back to your billing management page where you will be able to verify the completion status of your payments. You will also receive a receipt of payment email to confirm the purchase. You can go to your Subscriptions page to see the details of your renewal. It should be noted that all of these operations can only be performed by users with “Admin Access” privileges. You can configure privileges from the “Roles & Permissions” section under Account Settings. Leave a comment below if you have questions or if you manage to successfully complete any of the above processes. Our September Update is here and the theme of this update is “Payments Made Easy“. Since we launched in July this year, the only ways to pay for your subscriptions or SMS Credits have been in cash, cheques or via Direct Bank Transfer. Our September Update solves that issue with our integration with MPower Payments.